To make a trip exciting and memorable, the river is a great place to start. When staying at Chatrium Hotel Riverside Bangkok, you could experience a remarkable journey by having a big buffet breakfast at River Barge Restaurant with a spectacular view of the majestic Chao Phraya River to get yourself ready to explore Thai culture. Simply take Chatrium shuttle boats which arrive every 15 minutes in the morning to Sathorn Pier where you can take a boat to get a feel for the city and still have time to visit Wat Pho, Wat Arun, Wat Phra Kaew. 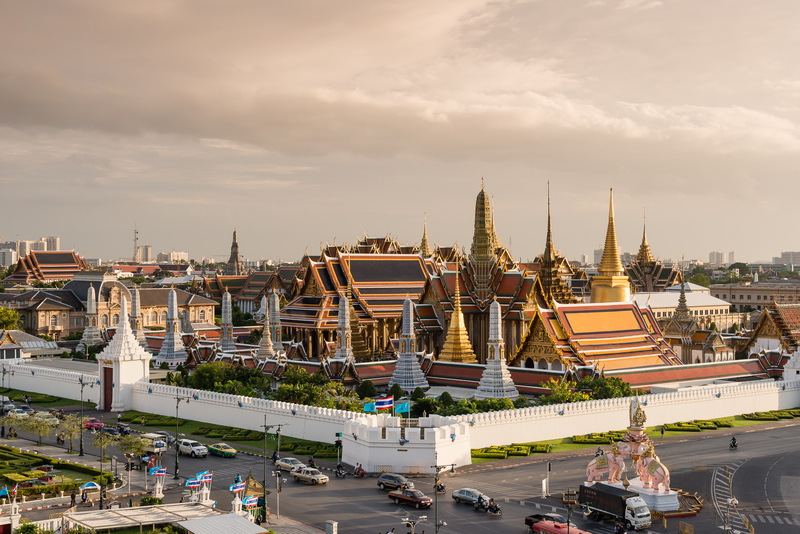 At the top of any Bangkok attraction list, you’ll find a number of temples and shrines. 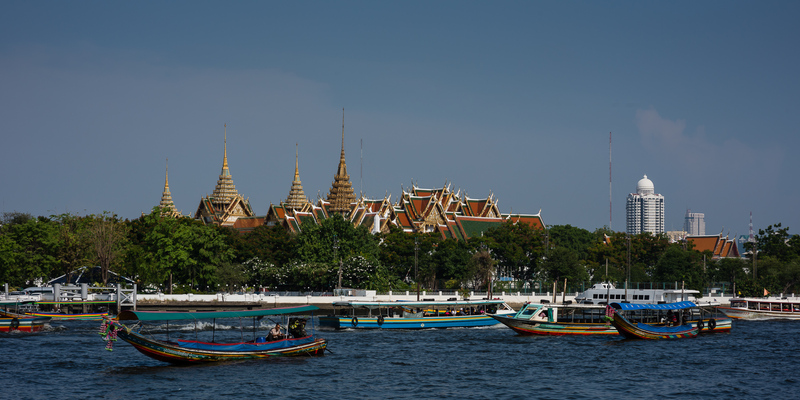 Here you can find three of the most popular temples that you must visit when travelling in Bangkok; Wat Arun, Wat Pho and Wat Phra Kaew. These can even be seen together within your half-day excursion. You might not have enough time to explore many temples in Bangkok. Tourists commonly spend much time going from one attraction to the next to visit as many attractions as possible. But if you have some time to slow down, Bangkok will reward you with an unbelievable recollection of the people and culture found here. 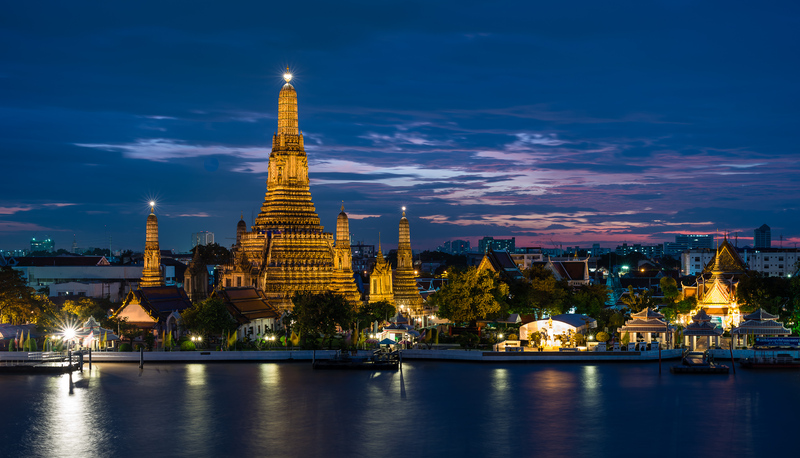 Located on the bank of the Chao Phraya River, Wat Arun is one of the most universally recognized temples in Bangkok. The riverside location makes this temple easy to access, and its design makes it stand out among the various temples in the area. 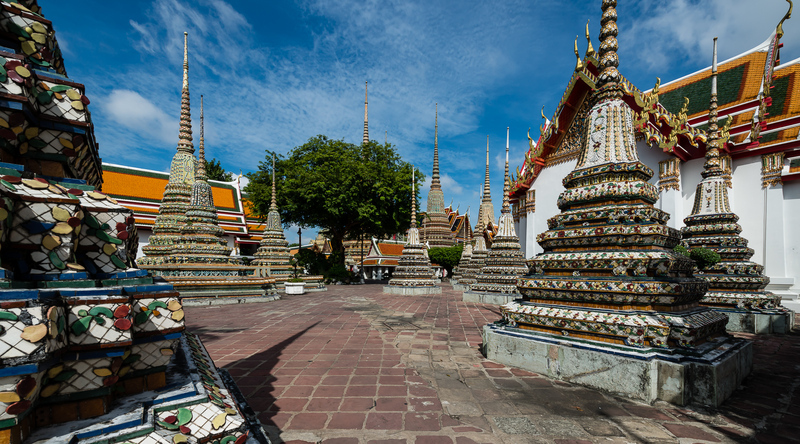 Wat Arun is also known as Wat Chaeng, and the name means Temple of the Dawn. The structure is composed of colourfully decorated spires that reflect in the water. Directly opposite Wat Pho, it’s easy to tour both of these temples in one day. A river boat will take you to Pier 8, where you can take a small shuttle boat between the river banks. Crossing the river between these two temples will cost you about three baht, and entry into the temple is 100 baht. You can visit this temple daily between 8.30 to 17.30. Although this is known as the temple of the dawn, it is absolutely stunning at night when it is lit up. This is a great site to visit early in the morning when you can take full advantage of the stillness and quiet of the temple, before the crowds begin to arrive. Consider a morning tour of the temple and return in the evening on a riverboat dinner cruise, or find a restaurant with a view of the temple lit up at night. Located behind the Temple of the Emerald Buddha, Wat Pho is among the largest temple complexes Bangkok has to offer and an absolute “must see” on any first time visitor’s itinerary. This temple is world renowned for its 46 meter long reclining Buddha that is covered in gold leaf. A short walk from the Grand Palace, about 10 minutes, this is a great stop between the palace and Wat Arun. Here, you’ll find the throngs of tourists dissipate as you wander around the complex. There are lots of people which gather around the reclining Buddha, but that crowd dissipates quickly as you progress into other parts of the temple. Additionally, this is a great place to schedule a traditional Thai massage since Wat Pho is considered one of the top schools of massage in Thailand. It’s a good idea to book your massage before exploring the temple complex so you can avoid a long wait in line. Entrance to the temple will cost you 100 baht and you can visit any time between 8.00 until 17.00. Wat Phra Kaew or the Temple of the Emerald Buddha is regarded as the most important Buddhist temple in Thailand. Located in the historic centre of Bangkok, within the grounds of the Grand Palace, it enshrines Phra Kaew Morakot (the Emerald Buddha); the highly revered Buddha image meticulously carved from a single block of jade. Arriving early is the best way to navigate the lines. Admission will cost 400 baht, but this is the most popular attraction in Bangkok, and it is a very large complex.